Palais du Zarmakoye de Dosso is part of the Tentative list of Niger in order to qualify for inclusion in the World Heritage List. The palace is located in the center of Dosso, near the main road Zinder-Niamey, which is also the most important road for the whole country. 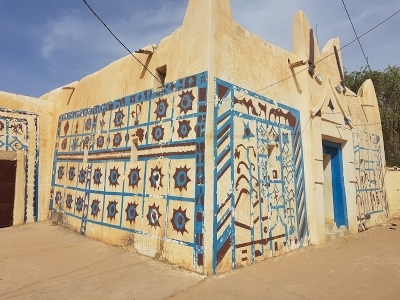 It is quite easy to find although the photos available in the Internet may be misleading – they show different palace in Maradi, not the one in Dosso. Sultan’s palaces may be found in almost all bigger cities in Niger, but the one in Dosso stands out a bit and, out of around five I saw during my trip, is the one I liked the most. It is very nicely painted, though its architecture from the outside is typical. We tried to enter but could reach only the first room – which had something like a wooden dome. The sultan was not home and the guardian perhaps saw “visitors” for the first time – he was literally scared that somebody wants to enter the palace in the absence of sultan. Overall the place does not deserve WHS status, but as a serial nomination of „Sultans' palaces in Western Africa” might be worth considering.